This dramatic peninsula design offers three-sided fire viewing-an extraordinary way to divide two rooms, while maintaining an open feeling. Especially suited for two living areas divided by a partial wall, such as a kitchen and eating area. 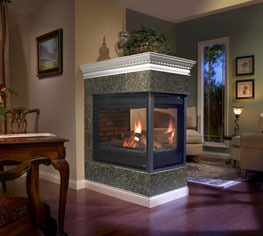 This 36" fireplace features a variable flame height control that will allow you to adjust your settings from 26,000 to 37,000 Btu's/hr input. installation. Uses economical 5” B-venting.